I'm a sucker for an old classic family musical. The Sound of Music was my childhood jam, I went through a long Calamity Jane stage (even bought myself some saspirella cordiel once. I probably still have the bottle somewhere today!) and Oklahoma, being one of my dad's favourite musicals as well as one of mine, was frequently ringing through the house. Imagine my joy then, when the UK tour of Oklahoma arrived at my local theatre, The Marlowe. Set in Oklahoma just after the turn of the 20th century, Oklahoma follows headstrong Laurey, a farm girl stuck between two men; proud but playful cowboy Curly and quiet, frankly unnerving hired hand Jud Fry. As far as family entertainment goes, Oklahoma is a fun and compelling ride! The show was led by the charming Ashley Day as Curly. I'd previously had the pleasure of seeing Ashley as Elder Price in The Book Of Mormon when he undstudied the role, and was very impressed with his portrayal. I already knew that he had a fantastic singing voice (which very much suited the Rodgers and Hammerstein music of Oklahoma) but at first I thought perhaps he was too clean cut for Curly. However, as soon as his first scene with Laurey ( Charlotte Wakefield) began, my concerns were quashed. He played upon Curly's teasing, boyish nature, which fleshed out his portrayal and made he and Laurey's love hate relationship believable. I think one thing that makes Oklahoma so popular (aside from the iconic Rodgers and Hammerstein songs) is the huge array of characters, and the UK tour cast were absolutely brilliant in that respect. Lucy May Barker was hilarious as Ado Annie, and her (impressively sung) 'can't say no' was met with rapturous applause, meanwhile James O'Connell's Will Parker was endearing. The pair were a perfect match. Statuesque Nic Greenshields was an imposing Jud Fry, and Belinda Lang won over the audience almost immediately with her big, raucous and spirited portrayal of Aunt Eller. As casting goes, Oklahoma was pretty much perfect! I do wish, however, that we could have seen more of Drew McOnie's fabulous choreography. The infamous dream ballet was brilliant in its tension and sense of foreboding and there were a couple of other entertaining sequences throughout the show, but unfortunately they seemed few and far between. I also found it odd that for well over half of act 1 there was no set change and very little change in lighting. Many of the scenes and songs seemed to take place in the front yard of Laurey and Aunt Eller's house just for the sake of it (such as 'Kansas city') but perhaps this was only brought to my attention because I'm so familiar with the film. Nevertheless, a change of scenery when the plot moved into the smokehouse home of Jud Fry near the end of act 1 was very welcome. 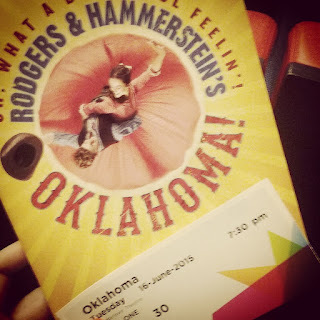 All in all, Oklahoma was a fabulously fun romp, with equal measures of tension and hilarity. Although the production perhaps lacked the pizzazz that other recent tours have had, I've no doubt that this crowd pleaser will entertain the whole family!